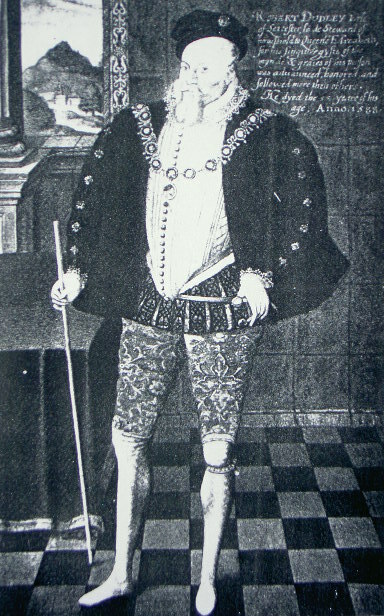 The Earl of Leicester dressed in the full attire of a Knight of the Garter is not one of his better known portraits. 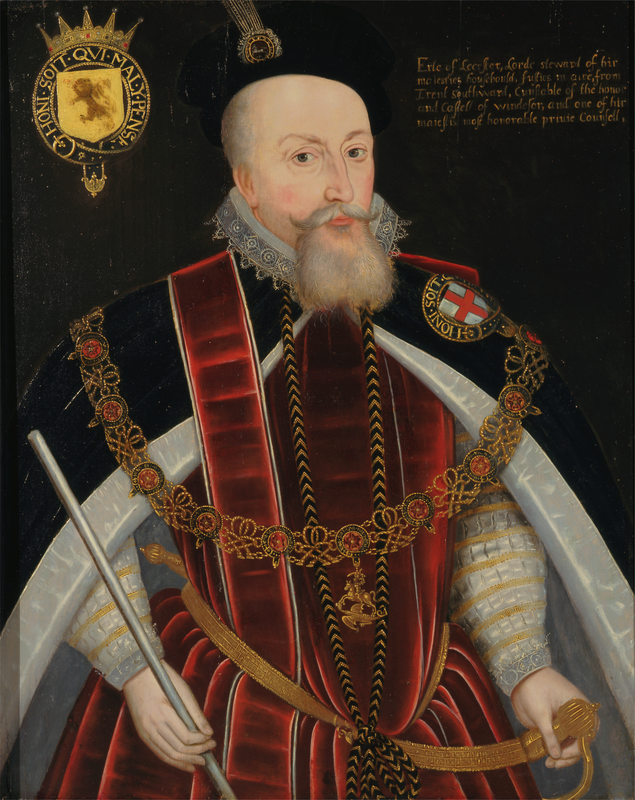 In the 1580s, though, it became fashionable for Elizabeth’s favourite knights to have themselves painted in their Garter robes, and Robert Dudley was no exception when he commissioned the above portrait in the last year of his life. He had recently received his appointment as Lord Steward of the Royal Household; it meant a lot to him, and he celebrated it by commissioning a number of new likenesses of himself, all displaying his new wand of office. However, when exactly he became the second most important official of the royal household, second only to the Lord Chamberlain, has long been a historiographical conundrum. Although the chronicler John Stow, who enjoyed his patronage, wrote that Leicester was appointed on 18 June 1587, historians used to ignore this statement and rather speculated that he became Lord Steward in 1584, or even 1570, following the death of the last holder of the office, the Earl of Pembroke. There are good reasons for this. Robert Dudley performed many of the tasks of a Lord Steward long before he actually held the office, while he was at the same time a very innovative Master of the Horse. To the latter office he held a strong attachment and – according to the Spanish ambassador Bernardino de Mendoza, who operated an excellent spy network in England – the earl was disinclined to give it up in return for the lord stewardship when asked to do so by Elizabeth in 1584. He was only prepared to cede the post three years later, to his stepson and the queen’s new favourite, the Earl of Essex. If Stow is correct, he received his reward on the day Essex became Master of the Horse. Four years later, in 1576, the Italian horse expert Prospero d’Osma dedicated his Report on the Royal Studs to the “Grand Master to her Majesty”, Robert Dudley; and the Journal of the House of Lords referred to him as Lord Steward in November 1584. Still, it was only after the earl’s final return from his Netherlands campaign, in December 1587, that “My Lord of Leicester” became “My Lord Steward” in correspondence and news reports. The court was victualled by “purveyors”, merchants who held the privilege to supply the royal household. They were much resented by other tradesmen because they could buy from the market at substantial discounts on behalf of the crown, which of course invited large-scale corruption. This was possible due to an ancient feudal royal privilege, namely that (in theory) the local population was obliged to pay for the court’s needs wherever it stayed. Parliament had repeatedly tried to restrict purveyors, and local exemption from purveyance was a highly prized privilege. Expenses of the royal household, on the other hand, grew alarmingly, year by year. In 1584, not as yet Lord Steward, Leicester embarked on a cost cutting programme. He began with restarting the activities of a royal brewing house, which was cheaper than to buy all the ale and beer from a cartel of 60 London brewers. This scheme died in March 1588, though, probably due to lack of funds to buy malt. Leicester still was proud to have saved the queen £1,000. In another case he sacked a purveyor after a public outcry at the court’s enormous demand of poultry; the royal purveyor and his men had turned to confiscating fowl in the shops and markets!7 The next year, 1588, Leicester died; Elizabeth never again appointed a Lord Steward. Memoirs of the Life and Times of Sir Christopher Hatton. (ed. Harris Nicolas, 1847). State Papers Relating to the Defeat of the Spanish Armada, Anno 1588. Volume I. (ed. J. K. Laughton, 1894). The Navy Records Society. Hammer, P. E. J. (1999): The Polarisation of Elizabethan Politics: The Political Career of Robert Devereux, 2nd Earl of Essex, 1585–1597. Cambridge University Press. Hoak, Dale (2004): “Edward VI (1537–1553)”. Oxford Dictionary of National Biography. Oxford University Press. This entry was posted in errors & myths, paintings, Robert Dudley and tagged Earl of Essex, Francis Knollys, Garter, Grand Master, household, James Croft, Master of the Horse. Bookmark the permalink.